© Carmen A. Weber, Irving Kosmin, and Muriel Kirkpatrick, Workshop of the World (Oliver Evans Press, 1990). As the area north and west of Fishtown developed in the 1840s, the old neighborhood name "Kensington" spread as well. Today, Kensington forms an upside down, L-shaped neighborhood around Fishtown, bounded by Erie Avenue on the north, 6th Street and Germantown Avenue on the west, Girard Avenue on the south, and Frankford Avenue, Norris Street, and Aramingo Avenue on the east. 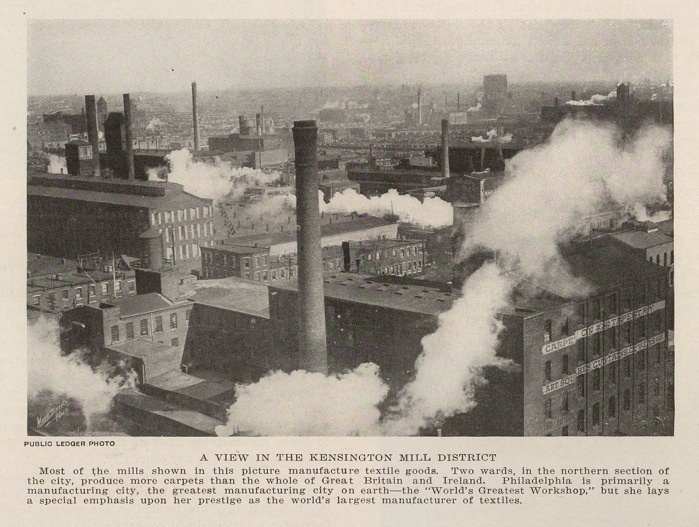 In addition to textiles, Kensington had a high percentage of tanneries and leather-working industries. Blodget, in 1883, listed 21 Morocco and calf-kid factories in the 16th and 17th Wards, with a product valued at $4 million. 10 These leather-working industries were in the district until the latter 1950s. Both the Drueding Brothers, at Master and 5th Streets, and Dungan and Hood, at Susquehanna Avenue and American Street, were listed in the 1957 Chamber of Commerce business firms directory; their buildings still stand. 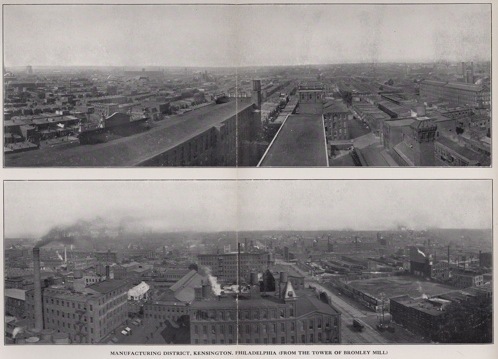 Burk Brothers, mainly connected with the Northern Liberties area, had a glazed kid factory at Hancock and Turner Streets in 1891. In addition to leather-working establishments, there were slaughter houses and meat distribution centers in the area. Both Swift and Armour had meat-packing plants along American Street and there were poultry markets as well. The diversity of the textile trades in Kensington grew in volume throughout the nineteenth century; however, the carpet industry predominated. In 1882, 141 Kensington carpet firms in the 19th and 31st Wards employed over 6,000 individuals and were valued at over $12 million. 11 The largest of these firms, John Bromley and Sons, covered more than a city block at 201-263 East Lehigh Avenue before it was destroyed by a fire in 1971. As with many Kensington firms, the Bromley mills had several Kensington locations before construction of the large power mill on Lehigh Avenue. 1 Lorin Blodget, Census of Manufactures of Philadelphia (Philadelphia, 1883), p. 66. 2 Philip Scranton, Proprietary Capitalism: The Textile Manufacture at Philadelphia 1800-1885, (Philadelphia, 1983), p. 218. 3 According to the Oxford English Dictionary, worsted originally referred to wool made from "well-twisted" yarn, spun from long, staple wool, combed to lay all the fibers parallel; it eventually applied to fine and soft woolen yarn used mainly for knitting and embroidery. 4 Blodget, Census of Manufactures of Philadelphia, p. 75-76. 5 T. Drayton, Plan of the City of Philadelphia, (Philadelphia, 1830); and J. C. Sidney, Map of the City of Philadelphia, (Philadelphia, 1849); and R. L. Barnes, Plan of the Built Portions of the City of Philadelphia, (Philadelphia, 1855). 6 Scranton, Proprietary Capitalism, p. 189. 7 Scranton, Proprietary Capitalism, p. 182. 8 Scranton, Proprietary Capitalism, p. 187. 9 Scranton, Proprietary Capitalism, p. 193-194. 10 Blodget, Census of Manufactures of Philadelphia, p. 70, 73. 11 Blodget, Census of Manufactures of Philadelphia, p. 77. 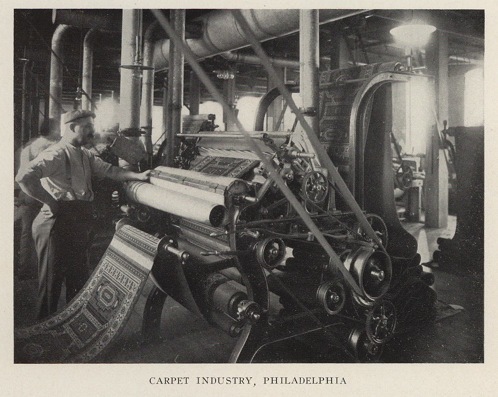 12 Philip Scranton, The Philadelphia System of Textile Manufacture: 1884-1984 (Philadelphia, 1984), p. 16. 13 Federal Writers Project, Works Progress Administration, Philadelphia, A Guide to the Nation's Birthplace (Philadelphia 1937), p. 517. 14 Philip Scranton and Walter Licht, Work Sights, Industrial Philadelphia 1890-1950 (Philadelphia, 1986), p. 169. Acknowledgements: Special thanks to Harold E. Spaulding, who provided in-depth research on the history and present-day sites of Lower North Philadelphia, which contributed to the chapter overview as well as the survey of buildings.